ok, here is the deal. My high school engineering class is currently researching. a keyless pad lock (for sheds etc), im always loosing keys and its a pain when youve got a lot of them to sort out which one you need. how about a padlock with a little scanner that you press your thumb on? you can get finger print scanners on door handles so i dont see why it wouldnt work on a padlock, maybe have a metal flap to cover the scanner when it isnt in use. How about redesigning BlenderArtists.org so that the amount of white light didn’t blind anyone who tried to use it inside. What type of engineering are you looking for? EE, ME, CompE, ChemE, CEE, etc. or is anything fair game? Make a car that is small, seats four people and is still aerodynamic. Look up coefficient of drag in wikipedia for a list of cars by air drag so you can see how to design. This is a huge problem because these cars are often too ugly for people to like and too hard to get in/out of because of size, but they’re necessary to reduce fuel consumption. how about another ergonomic mouse? or chair? To play games they must exercise. You could also make a model for overweight spouses like mine. But rather than a game console, have a pair of handcuffs, and a very, very long feeding tube attached to the treadmill. A turbine powered by a treadmill is a treadmill powered fan. I really wish they would teach better English in public schools. Did you read the article, or did you just look at the picture and assume you were right? FYI, I’m in engineering school. I’ve taken thermodynamics, and I can tell you with absolute certainty that the first line of that wikipedia article is true. If you were to simply rotate this particular engine all it would do is move air. If you were to attach this particular turbine to a generator and move the turbine by some means, then it would be a gen-set. I’m curious… did you go to public schools? I certainly did. A fan moves air. 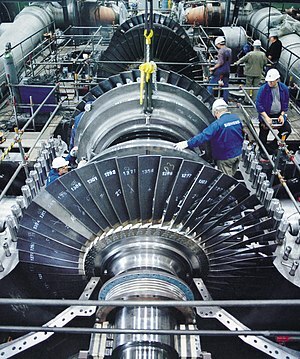 A turbine does too if you turn it, though it’s typically designed to be turned by a moving fluid. Don’t get mad at me and start throwing insults, I didn’t make you wrong, I just noticed and pointed it out. I think DarkCGI has got the idea down…anyone else wanna give it a shot?